Home / Blog / Competitions & Giveaways / Congratulations to all of our prize winners! The lucky winner of the fabulous prize of 2 nights in Santiago de Compostela is Pol Howlihan. Congratulations to the lucky winners of the €100 CaminoWays.com vouchers. Finally, the winners of the two €100 vouchers for 53 Degrees North are John Moran and Sean O’Dwyer. 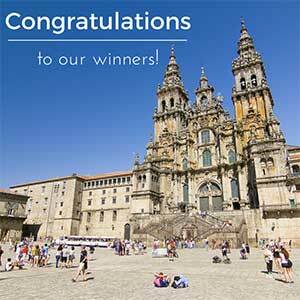 The winner of 2 nights in stunning Santiago de Compostela is Coralie Cousin. The winners of the €100 CaminoWays.com voucher are Bree Garrick and Sonia Bungaroo. Thank you so much to all of those who entered and we hope that all of our winners are happy wit their prizes! To claim your prize please send an email to marketing@greenlifetours.com. Congratulations Coralie, we’ll send you the details shortely. Oh fantastic, what great news!! I so wasn’t expecting this… Let me know the details?